The top-flight folks are in the Aces, a group of five pilots with their own custom outfits and droids who protect the Colossus and take on all challengers in harrowing races. Hype Fazon (Donald Faison) is a cocky Rodian showoff whose heart is in the right place, Griff Halloran (Stephen Stanton) is a gruff ex-TIE pilot, Freya Fenris (Mary Elizabeth McGlynn) is a fierce lady who’s all business, and Bo Keevil is the mysterious, quiet daredevil of the group. 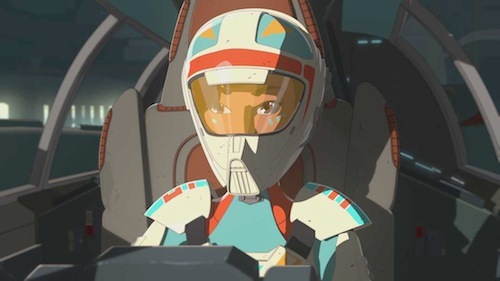 Star Wars Resistance, inspired by Top Gun and The Right Stuff, premieres on Disney Channel, 7th October, with a 1-hour special titled The Recruit. Disney reached out on Twitter to confirm the series will be shown in the UK, too.